A Chicago-based plaintiffs' law firm has filed class actions on behalf of citizens from 10 countries who allegedly suffered serious injury or death from the pain medication Vioxx. The latest action was filed last week on behalf of Polish citizens. In re: Vioxx Products Liability Litigation, MDL No. 1657, (E.D. La. ).Similar litigation has been filed on behalf of Vioxx users in Italy, England, France, Australia, Canada, New Zealand, South Africa, Germany and the Netherlands, according to Kenneth B. Moll of Kenneth B. Moll & Associates, who has filed the actions. 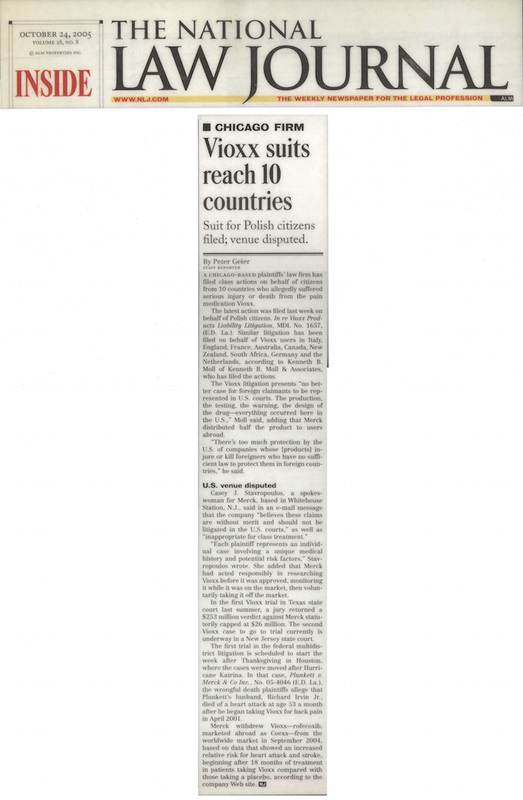 The Vioxx litigation presents no better case for foreign claimants to be represented in U.S. courts. The production, the testing, the warning, the design of the drug-everything occurred here in the U.S., Moll said, adding that Merck distributed half the product to users abroad. There's too much protection by the U.S. of companies whose [products] injure or kill foreigners who have no sufficient law to protect them in foreign countries, he said. U.S. Venue Disputed Casey J. Stavropoulos, a spokeswoman for Merck, based in Whitehouse Station, N.J., said in an e-mail message that the company believes these claims are without merit and should not be litigated in the U.S. courts, as well as inappropriate for class treatment. Each plaintiff represents an individual case involving a unique medical history and potential risk factors, Stavropoulos wrote. She added that Merck had acted responsibly in researching Vioxx before it was approved, monitoring it while it was on the market, then voluntarily taking it off the market. In the first Vioxx trial in Texas state court last summer, a jury returned a $253 million verdict against Merck statutorily capped at $26 million. The second Vioxx case to go to trial currently is underway in a New Jersey state court. The first trial in the federal multidistrict litigation is scheduled to start the week after Thanksgiving in Houston, where the cases were moved after Hurricane Katrina. In that case, Plunkett v. Merck & Co Inc., No.05-4046 (E.D. La. ), the wrongful death plaintiffs allege that Plunkett's husband, Richard Irvin Jr., died of a heart attack at age 53 a month after he began taking Vioxx for back pain in April 2001. Merck withdrew Vioxx-rofecoxib, marketed abroad as Coexx-from the worldwide market in September 2004, based on data that showed an increased relative risk for heart attack and stroke, beginning after 18 months of treatment in patients taking Vioxx compared with those taking a placebo, according to the company Web site.